Apparently, one of the most stressful things in life is moving home. Whoever believes that hasn't tried to replatform a website. As a member of the Wolfgang SEO team, I've carried out many site replatformings. 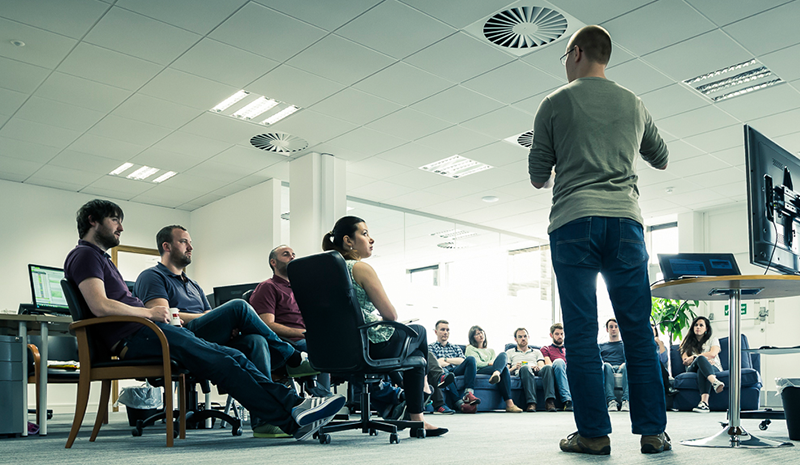 We apply technical SEO to website migrations to protect traffic and revenue. Below you can watch the talk in full from Google's Foundry, read a transcript of the talk and look through the slides on Replatforming and SEO. I'll be covering re-platforming site migrations. One of the things or some of the things they used to say years ago. The three most stressful things in life are moving house, changing job and getting divorced. The fourth most stressful is changing websites and the fifth most stressful is doing a technical SEO presentation five minutes before a prosecco party. Thanks, Al, cheers for that. So what type of migrations can we have? We have a domain to domain so if you're keeping the same domain you might be redesigning your site and moving your CMS. We have to merge two domains together maybe you bought a competitor or you bought a network and push that in together. We have a HTTP to HTTPS and we also have an old domain into a new domain may be a rebranding or something similar to that. So, we're going to be concentrating on HTTPS purely because this is becoming a hot topic this year. Moz has just come out recently told us that 50% of the current search results on Google are secure results; HTTPS results. the chart released by Dr. Pete last month is indicating that by the end of this year 70% of those searches will be will be secure. So, why is this actually really important and it's because I'm reading the wrong slide. It's because Google are shaming websites which aren't secure. This is mine not secure, it is secure now by the way and you go nice little warning. This develops an untrusted level with your users. So, this type of warning detracts away from people visiting your site. Unfortunately in a HTTPS migration can and occasionally do go wrong. Some of the ways it can go wrong is your site can be lost from Google by simply transferring all your HTTP the HTTPS. Google gets lost and they can no longer find your pages. Another way hilarious dog yes that's the best way to get attention, another way that can go wrong is it can create a redirect link. What happened is you have a HTTPS going to HTTP on your home page which then redirect back to HTTPS, looks something like this. Got you! And the third thing that can happen is you can actually appear twice in search results with a HTTP result and the HTTPS result. So you end up with duplicate content and everybody knows that Google doesn't like duplicate content. So, what does that look like for your traffic? The first arrow is migration day. The second arrow is the when Wolfgang Digital was asked to help. 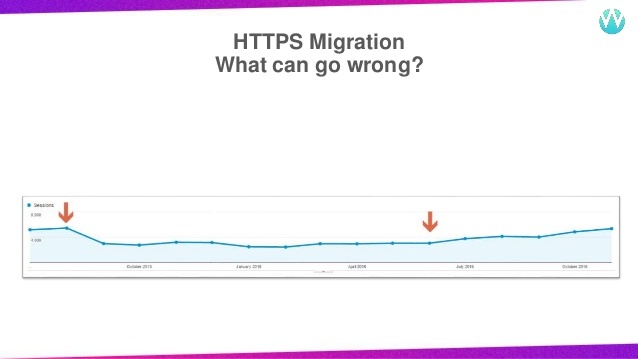 This is an example of a https migration that went wrong here, back in October 2015 and then over here is when they finally actually realized you know what we do need some SEO help here. So Wolfgang stepped in here and we migrated again to the secure version of the site correctly the way she'll be done by taking the SEO into account. We also did a bit of other SEO voodoo but within 60 to 90 days they were back to pre-migration levels and then since that they've actually achieved higher than what they originally had. So, HTTPS migration is an extremely complicated thing but I'm going to try and give you a little bit of a framework. So, instead of going at it from a technical point of view you're actually thinking of it as a nice simple thing we're probably all familiar with. Try think of it exactly like moving house so, the first thing you're going to need to do is to find all your stuff, box it up, get rid of anything else that you know might not be useful anymore, take your old clothes and throw them into the charity bins. This is the list you're going to need to follow for the technical stuff. Once you've found everything you want to move that to your new place, your new house, your new website box, unbox it all in the nice neat and ordered manner so that people can find it. Basically, give it a quick polish and get everything cleaned nice and tidy in your new house, from there one of the things you need to do is you need to tell everybody that you've moved, you need to invite your friends and your mum and your dad to your new house warming party. We say we need to send a letter to Google, we also send a letter to the post office, tell them this is what this is my new address is where I live. I invited everybody round and everybody then can find your new place. Google needs to do the same thing as Kevin mentioned earlier we use search console to do that and finally, we go back to your old place and we check to see if you left anything behind. This is partly done by finding all of your social and your existing backlinks making sure that they point to your new domain, your new address the HTTPS. So, that's boiling down a very complicated and technical manner into something which we can do not on an everyday basis maybe once a year maybe twice a year if you're renting. We think of it in a nice simple way of keeping everything organized, keeping everything together and coming into a new place or and finally get somebody to help you and that's it.